John Leonard Insull was the greatest and most prolific maker of vent figures England has ever produced. He was born on August 5, 1883. He spent his early days in Wolverhampton and began his career as an apprentice to a joiner. However he soon developed a taste for magic and decided to go on stage under the name of Hinsle, the Comedy Illusionist. He was often assisted by his wife Gertie Rees, who did a clog dance; and eventually they toured the world together. During the 1930's the Talkies accelerated the decline of Variety so he set up a properties business. He had already been successful with 'Freda the Friesian' made for the Wembley exhibition in 1924. 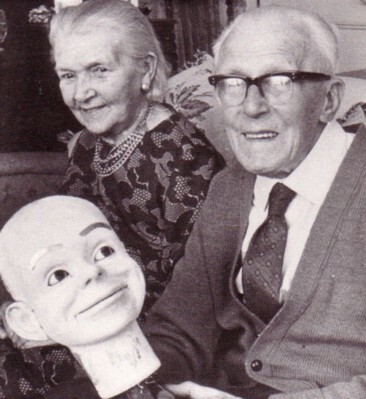 As a result of a challenge made by Coram the Ventriloquist -- that if he could make a better dummy than the one he was using, he would buy it -- he embarked on a venture that would ensure a permanent and illustrious place in the history of ventriloquism. News of Insull's work reached Lewis Davenport, who asked Insull to supply his magic business. 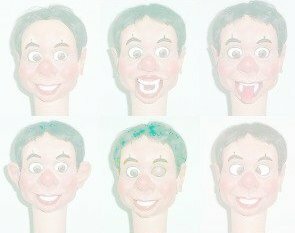 He made two basic heads for Davenports: a No.1 head with three movements: bottom lip, top lip and turning eyes; and a No.2 head with the above plus two winks, moving eyebrows, and ears. He also made a series of special figures, including Archie Andrews for Peter Brough and the first Lord Charles for Ray Alan. 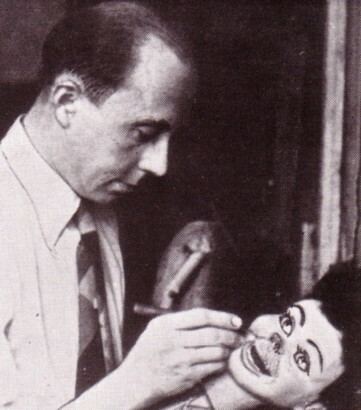 Leonard Insull worked with his son (also named Leonard Insull) who specialized more in animated slot machines - although he also made a range of figures for Max Andrew's 'Vampire Magic'. The collaboration ended with the death of his son in 1957 aged 43. Towards the end of his life he had an apprentice called Bernard Maeder who worked with his partner Andrew Geive for a while but they eventually gave up the business and moved to Ramsgate where they opened a guesthouse. Leonard Insull died in 1974. He was still making heads until his final illness and had orders for more. Between 1952 and 1974 he produced no less than 2017 items of which: 317 were no. 1 heads and 528 were no.2 heads plus 338 usual bodies, 100 half sized heads, 39 half sized bodies, 80 specials, 32 special bodies, 316 skulls, 50 toby jugs, 16 vest pocket figures, 4 canes and 197 other items.